Anyone who has been to the Beaty Biodiversity Museum on UBC’s Vancouver campus will have had a close-up encounter with the 26-metre skeleton of a blue whale suspended above the entrance, but how many can claim they’ve been fully immersed in the cetacean’s underwater world — a world where the largest mammal on Earth (this time fully-fleshed) swoops down beside them and blinks? Seeing a blue whale materialize in front of their eyes is exactly the experience that visitors to UBC’s Emerging Media Lab can expect — once they’ve donned virtual reality goggles and headphones, that is. They can also bat asteroids out of the way to get a better view of the moon, or walk around a Van Gogh painting and peer out a post-impressionist window at the starry night sky. The Emerging Media Lab is a campus-wide collaboration that is making the latest and greatest gadgets accessible to UBC students, staff and the public, all with the goal of exploring how new technologies might be used to enhance teaching and learning. Opportunities to engage with virtual reality (VR) are becoming increasingly common. The New York Times, for example, mailed out over a million $20 Google Cardboard headsets, so their subscribers, armed with nothing more than a smart phone, can experience immersive stories. One such story — “The Fight for Falluja” — invited them to enter Iraq much like an embedded journalist, via a 360-degree video. In a similar vein, Google Expeditions distributed kits, including headsets and phones, to classrooms around the world, allowing students to virtually visit places like Mars or Machu Picchu. But these video-based experiences, although stimulating, are mere shadows of the higher-end immersions, which enable users to interact with, move through and make choices to change the reality they see, says Dr. Ray Hsu, one of two faculty-in-residence at the Emerging Media Lab. These deeper-level experiences, he explains, have yet to hit the mainstream, and part of the reason is cost. Headsets like Oculus Rift and Microsoft’s new HoloLens cost hundreds of dollars and must be connected to fast and expensive processors in order to provide the seamless streaming images that give users the impression of being in a whole new world. Still, Hsu, a professor in the Social Justice Institute, can’t help but see the potential for immersive technology in education, and he’s determined to get more people at UBC involved in this growing field. What excites him most about VR is the prospect of “getting out” of the classroom. With headsets on, he says, “you are not tied to a particular location. You are separated from the entire world around you.” And you can also go to places you couldn’t visit in the real world. This level of immersion can help students understand things that already exist, such as the circulatory system (there’s an app where you can travel like a blood cell through the body), but they can also examine things that have yet to come, such as proposed environmental designs to reclaim polluted industrial sites. Wagner’s striking innovation was to turn down the audience lights for the first time, thus plunging opera-goers into an experience focused solely on the brightly lit stage. “We are once again on the verge of a new kind of immersion,” Hsu says. For Hsu, immersive technologies are akin to opera. He quotes mid-19th century composer Richard Wagner, who envisioned a total work of art, a genre that incorporated “music, theatre, dance, visual art, poetry, everything — into one unified form.” Wagner’s striking innovation was to turn down the audience lights for the first time, thus plunging opera-goers into an experience focused solely on the brightly lit stage. “We are once again on the verge of a new kind of immersion,” Hsu says. 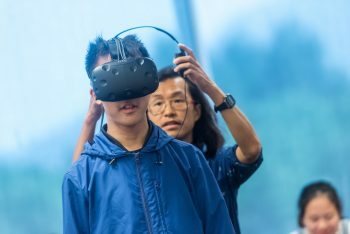 To help people envision what’s possible, Hsu has given more than 200 demonstrations to students and staff at the Emerging Media Lab, a collaboration between UBC Information Technology and the Centre for Teaching and Learning. This multi-location facility means users can access new technologies at various sites across UBC’s Point Grey campus, including the Faculty of Education. Hsu, an award-winning poet with a PhD in English Literary Studies from the University of Wisconsin–Madison, wasn’t always obsessed with the high-tech world. He first came to UBC as a teaching fellow in the Creative Writing department in 2008. A few years later, he left teaching to focus on a variety of creative pursuits. During that time, he developed an online marketplace for writers, and The Globe and Mail named him “one of Vancouver’s most promising young entrepreneurs.” Although his venture didn’t pan out, the experience gave Hsu a taste of Vancouver’s thriving tech start-up scene. He soon discovered that educators and students were a hugely-coveted audience, but no one had hit upon education’s “killer app.” And when he looked around at the programmers, entrepreneurs and creative types in the high-tech world, he realized he was the only educator in the room. Saeed Dyanatkar helps fit a student with a VR helmet (Photo: Martin Dee). In the end, he joined forces with Saeed Dyanatkar, executive producer at UBC Studios and the Emerging Media Lab, to found the Virtual Reality/Augmented Reality User Group. His goal was to create a community where colleagues and students can not only come together and discuss ongoing projects, but also keep abreast of the trends. The geography department had been searching for a way to deal with an increasing number of students and a decreasing budget for field trips, says Professor Loch Brown. Their goal was to find a way to use VR and AR to play with time, space and scale — in effect, he says, “to overcome the tyranny of geography.” For example, he and his colleagues are collecting 360-degree photographic and video data on street corners, so that in 10 or 15 years students will be able to travel back in time to see how gentrification has affected neighbourhoods such as Vancouver’s Downtown Eastside. Another initiative will allow students wearing headsets to virtually leap 200 metres into the air for a bird’s eye view of a bog on the landscape, and then zoom back down to a microscopic level to understand the cell system in sphagnum moss. Creative Writing professor Jennifer Moss has also become involved. She teaches writing for new media and has her students write scripts for virtual reality concepts. “Every genre has its tricks,” she says, “so you have to know what ones will work. Especially in an environment where you can’t control the gaze or movement of your audience.” A long-time radio documentary producer, who has spent time working with the National Film Board on new media and VR projects, Moss would love to see more collaboration between the arts and sciences in these types of projects. In collaboration with the student-led AMS Game Development Association (AGDA), Chen created a 360-degree tour through Vancouver’s modern-day Chinatown. Through the app, users virtually experience places like the Sun Yat-Sen garden while learning about the history and evolving public perception of the neighbourhood. All the high-tech gear like HTC Vive, Google Daydream, Oculus Rift and Microsoft HoloLens is at their fingertips, along with game-development software and high-speed computers, giving teams access to equipment they would not have been able to purchase on their own. Chen became so entranced by the technology that she went on to create a separate AGDA VR arm for other keeners. Soon there was so much interest from students and faculty that she wound up with a summer work/learn position at the Emerging Media Lab. Under the supervision of Dyanatkar, she coordinates the space and technology for groups of students, staff and faculty who want to collaborate and experiment with immersive technologies. All the high-tech gear like HTC Vive, Google Daydream, Oculus Rift and Microsoft HoloLens is at their fingertips, along with game-development software and high-speed computers, giving teams access to equipment they would not have been able to purchase on their own. “The lab is where groups can explore, collaborate and develop ideas,” says Dyanatkar. They will be supported through their incubation process, then Emerging Media Lab staff will record findings, noting what succeeded and what could be done differently, so that other departments can learn and improve on techniques. “The group always has permission to fail,” he says. Loch Brown cites the Emerging Media Lab’s invaluable role in the VR projects he’s been working on, and points to the many students who have led the way in troubleshooting technological issues or learning new programs. “There is a strong cohort of undergraduate students who are hungry to work on these types of projects,” he says “and there is growing faculty interest too.” For his part, Brown is keen to ensure the work the geography department does is open source and shared with the wider community, not only for the sake of learning, but to help position UBC as a leader in the emerging technology field. Hsu is happy to see the variety of work that is taking shape on campus. For him it adds to the evolving conversation about using immersive technologies in education. “Universities are meant to be hotspots for innovation,” he says, but in every institution, some are resistant to change. “When people are concerned about technology disrupting things, it is usually coming out of fear — fear that VR is going to replace teachers, for example,” he says. But it is more helpful to figure out how VR can positively affect learning outcomes, both within and outside of the traditional classroom. And in that realm, according to Hsu, the only limit is our collective imagination. It is satisfying and exciting to see technology having the potential of expanding our understanding of scientific and social issues. As we eliminate opportunities for the poor and underpriviledged to have first hand experiences with animals in controlled environments such as Stanley Park, having VR in classrooms for them would be the next best thing. And who knows, it may be the catalyst for some of these underpriviledged to aspire to higher education. Having the very brief but impactful experience with virtual reality in Bjorks collaborated showing with MOMA I’m very excited, impressed, and awed at the possibilities. That being said I also know that with all the bright minds/technology available I’d rather it be directed at how we are going to help educate people towards innovative ways to work united in saving humanity on a dying planet. How can we all work together in ” like-minded” actions and use this to reach all who want to make the differences happen before we can’t. Otherwise there will be tons of tech not able to access stored away invisible to the reality around us as we desperately try to survive.